Near the north beach Enter Sandman, Monroe park neighborhood by Lake Michigan, 95 Esplanade. walk to downtown. 3 Bed/2 Bath Sleeps 10 in the Famed Monroe Park Neighborhood. Popular Location for Summer Fun. This North Beach Gem has it all! 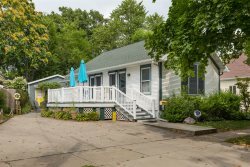 Steps to the Sandy Lake Michigan North Beach, a freshly remodeled family Beach House with all New Furnishings, 2 Decks- One with Lake Views, PLUS a spacious patio for grilling and Outdoor Dining. The location of Enter Sandman in the Historic Monroe Park Neighborhood, has attracted visitors for generations because of its perfect proximity to the North Beach, an easy walk to downtown, and the added bonus of Bunde's Bakery with homemade delicious treats and Starbucks coffee. The closeness to the beach makes it easy to come up for naps, lunch, a break from the sun. The home has been completely freshened with modern paint, beautiful wood floors, cozy beds, fine linens, and an open main floor with large dining and living areas. Outdoor spaces include 2 Lakeview decks and a roomy patio for family meals. Bedroom 1. Upper Level. King Master. Bedroom 3. Upper Level. 2 Bunks. Landing Area. Queen Sleeper Sofa. Bathroom 1. Main Level. Jacuzzi Tub and Shower. Bathroom 3. Upper Level. 1/2 Bath. Master Suite. Parking for 2 off street. Street Parking on North Shore Dr.